Note: You must replace homeserver in the above URL with the name of the computer where you install uTorrent. You should see the uTorrent Web UI. 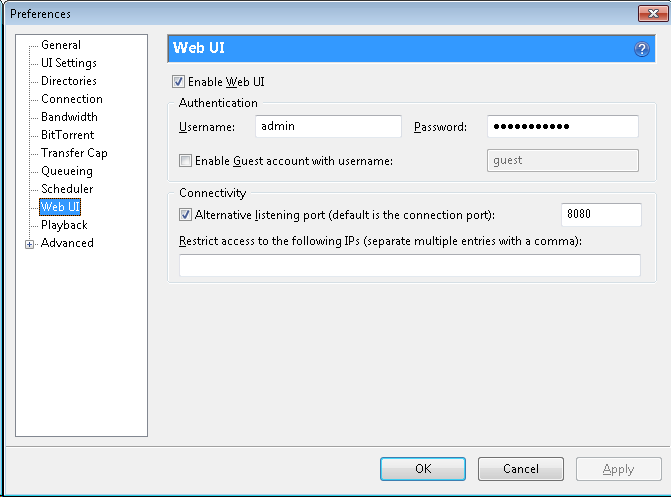 If you do not see the uTorrent Web UI do not proceed any further. You have a networking problem. Seek help. Important: Now Close down uTorrent by choosing File->Exit. Download Windows Server 2003 Resource Kit Tools (11.8 MB). Install the entire tool suite as normal, by opening the downloaded exe. If you get the “Access is denied” error then you are not running as administrator. 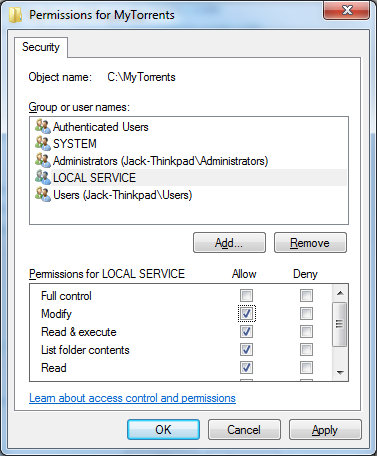 By default Windows will not allow your uTorrent service to read or write to the disk. In order for uTorrent to work you need to add read & write permissions on the directory or directories you specified in Step 2. Locate the service named uTorrent and verify the Status column says "Started". Log off your Windows session and repeat Step 3 to verify that the web UI is still working and you can download torrents successfully. Double check that uTorrent.exe is not running on your desktop. Double check that uTorrent.exe is running as a service.